Club Penguin Cheats by Mimo777 Club Penguin Cheats by Mimo777: Club Penguin Party News...Super Hero Party! I'm having one TODAY! On Little Space Heroes! Today at 4:30 pm Pacific Time / 7:30 pm East Coast Time. Make an account and come hang with me today! I got a balloon and met two nice kids for my friend list. 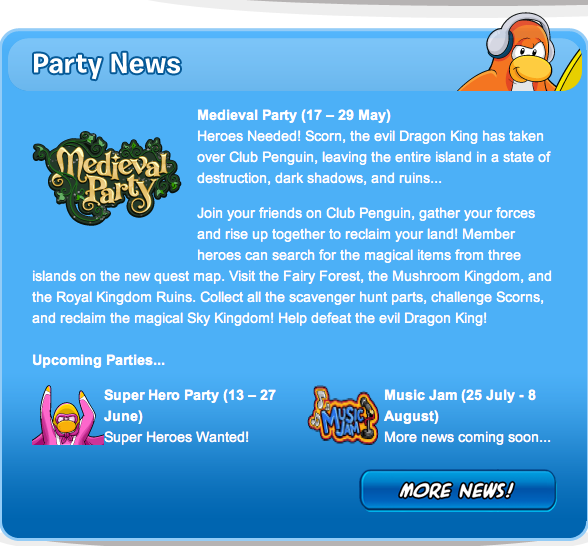 The about 1 month space between super hero party and music jam makes me suspicious. It could be that card jitsu snow or shadow(if it even exists) will finally release then. Then i couldnt help but notice the line "leaving the entire island in a state of destruction, DARK SHADOWS, and ruins..."
It could be another hint. I hope they give us a free mask or cape or both in the super hero party. I have a Promo Code for Little Space Heroes!